Alsager College is a student sports oriented institution in Cheshire and back in the days when all matches were friendlies their 1st XV were due to play our 2nd XV and Alsager’s 2nds were down to play us, both matches at Lightfoot Green. 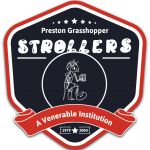 Now in those pre-internet days the teams were listed on the noticeboard rather than electronically disseminated and the Strollers appeared after the 5th XV. On seeing that they were apparently due to play the apparently sixth rated team compounded by the fact that they were a “bunch of old men” Alasger took great umbrage. Without consulting us they explained the position to Hopper’s 4th XV skipper who were also playing at home. It was explained to him that Alsager were all fit young college students specialising in sport and raring to go and to match them with these had beens would be a travesty. Alsager would simply run rings around the Strollers. They therefore conspired to switch opponents so Alsager were to play the 4th XV and the 4th XV’s scheduled opponents were to take on the Strollers. This was not well received and the Strollers refused. With ill grace Alsager had to accept that the original fixture must stand. It is fair to say the Strollers were revved up but we really only played our normal game. Alsager were mauled to death and hardly saw the ball. Estimates of the time and distance of rolling mauls have increased over the years but it is definitely true that orchestrated by “Stan the Rolling Maul Man” they were the feature of the game. Even on those rare occasions that the ball got to Alsager’s allegedly speedy backs the tackling was in their faces and impeccable. Inevitably the Strollers won but it has to be said to Alsager’s credit that they were impeccable after the game. They mixed in with us and were magnanimous in defeat, admitting they had totally mis-judged us and it was one of the best lessons they had received. They sent a letter to the Club to that effect – honour was satisfied, and they made damned sure they never played us again! !